Since cars were really rather expensive the general populace went about their business as they had done so for centuries. Slowly the internal combustion engine took over from the horse and steam engine. While this took time so did the evolution of the body work styles, and lets be honest, most people are happiest with what appears familiar and safe. The traditional methods of transport for goods and passengers had already undergone one revolution when the trains came thundering through the landscape. While the horse could hold it’s own in the towns, and was affordable for small operations, it could not compete in the speed stakes against the train, nor could it carry as much. Now the train was going to face its own threat for superiority, but it didn’t seem much of a threat at all for quite some time. While steam powered cars competed closely with internal combustion engine vehicles in the early years of the car neither was fast enough, or reliable enough, to compete with the train, surely not? 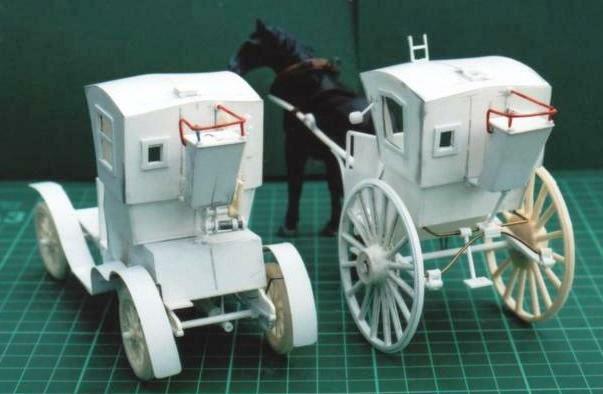 Stage-coaches existed in the 17century, but many vehicles described as ‘coaches’ would have been covered stage-wagons carrying passengers and goods. The landed gentry were only too willing to sell their land to the railway companies and extol the virtues of the steam engine, as long as it stayed off the roads. An unfortunate consequence was the roads were neglected and left to deteriorate. Goods travelled by Cannal and by Train, only the select few travelled very far anyway so nobody seemed too concerned at the state of the roads. William Hancock's steam coach "Enterprise". 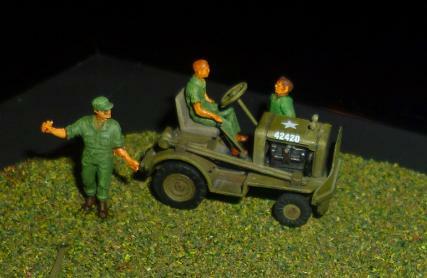 1/24th scale scratch built model. In 1833 Hancock's steam omnibus, the "Enterprise" (built for the London and Paddington Steam Carriage Company) began a regular service between London Wall and Paddington via Islington. It was the first regular steam carriage service, and was the first mechanically propelled vehicle specially designed for bus work to be operated. Joseph Aloysius Hansom’s cab of 1833 was unlike the vehicle that made his name a household word. Huge 7’ 6” (2.3m) diameter wheels made the absence of springs relatively unobjectionable! Edward Bulnois modified the Hansom using smaller wheels on a cranked axle. A better cab was patented by John Chapman but his company was bought out by the owners of the original Hansom cab patent. Chapman’s cabs were in all essentials the ‘hansom’ cabs which survived for the next 70 years. Due to the publicity given to the Hansom patent later cabs were still called by Hansoms name instead of their designer’s name. The method of scratchbuilding can be seen here for the 'cabs', and how poeple tend to think along the same lines before moving ot to new ideas. Motor cabs. Several manufacturers produced motor cabs but the first petrol cabs to ply for hire in London were Rationals, designed and built by Cockshoot & Co. Other firms such as Argyll, Belsize and Humber after building a few cabs found their car business in need of all the manufacturing space available and no cab company was prepared to place a large enough order to make cab production viable. One of the oddest vehicles came from Vauxhall; a 1904 two cylinder motor hansom with driver’s controls and seat out-rigged at the back of the roof. You shudder to think of the number of corners and connections the steering and other controls had to go round before performing their function. The design was suggested by the Earl of Ranfurley…..it never caught on….. and fortunately none ever plied for hire. 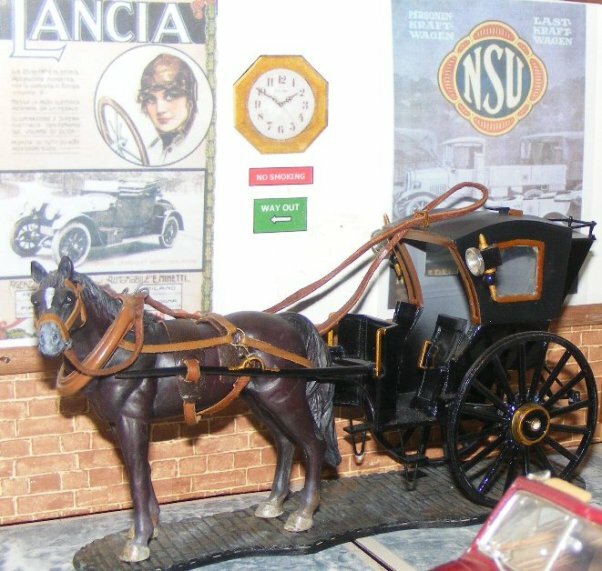 The model cab’s on display replicate a Forder built cab of c.1890 (Horse purchased from the Norfolk Shire Horse Centre) & a 1904 Vauxhall ‘Hansom’ mounted on a 1904 Vauxhall car chassis similar to the yellow 1905 Vauxhal shown here, all are scratch built to 1/24 scale. As the industrial revolution brought more and more people into towns and cities, getting around the cities became more of a problem. Walking was time consuming and brought a certain degree of risk at various times of day. If you could aford a cab, all well and good but many people yearned for a lower cost system of travel. Harking back to the steam buses came horse drawn buses and later trams. Trams became horsless as electricity became more and more practical. At last there were reliable low cost travel systems moving workers and consumers around the towns and cities. And new job oppertunities for the drivers and mechanics and electricians too. The first tramway in England was laid by George Francis Train, an American, who obtained permission to lay tracks from Wood Ferry to Birkenhead Park. The service started on 30th August 1860 with L-shaped rails that protruded ¾” (2cm) above the road surface, much to the annoyance of carriage and wagon owners; the track had to be re-laid with grooved rails. Originally designed and built in 1907 in three basic series. The model is a Walthamstow/Croydon car built for their System and later merged with London Transport. Union Construction Co. Feltham Tramcar. The London Metropolitan Electric Tramways began a series of experiments in 1929 and a year later introduced an experimental ‘Pay as you enter’ car, number 331, with central entrance and exit and known as ‘Cissie’. Known as “Princess Alice” was amongst 27 built by English Electric from 1934 to 1937. 13 of which were the open top variety. Just as the horse drawn coach and cabs gave way to electric tramways, so the horse drawn trolley bus also was superceded by the internal combustion engined omnibus. These transferes were not without there conflicts and problems but a brave new world of public transport could not be stopped. Little by Little the bus companies fought with the cabs and trams, and each other, for the rights to business in the towns and cities. But more than that, the quick minded business men realised they could compete with the railways for trips to the seaside or into the countryside. The charabanc trip became a new social outing and before long these motor-coaches were also prividing links between towns and villages. The 1911 B-type Motor Omnibus. The London General was formed in 1856 by the purchase of several independent horse-bus concerns and the early steam and electric motor buses were based on the horse bus. With the internal conbustion engine becoming a reliable item many other things were suddenly much improved. It was not only the Fire appliance that was moving under its own power that made fire fighting more effective, the centrifugal pumps became much better as the rpm rate of the internal combustion engines was much higher than that of the steam engines pumps. The Dennis chassis was used for a number of vehicle types, as was common at the time, but none is more evocative than the pump escape. With Zeppelin raids increasing London fire brigade needed the latest equipment, little did they know how much worse was to come just 25 years later. Both models are 1/32nd scale Airfix kits. During WW1 the internal combustion engine technology took huge leaps forward. Aeroplane engines gave ever greater power and engineers were learning all the time about carburation and valve opening over lap. Trucks were used for transporting men, and all manner of materials, so by the end of the war not only were the machines themselves much improved and more reliable, people were used to them being around too. Between the wars cars, buses and taxicabs all took the roads in ever increasing numbers but the old leveler of money still kept most people reliant on the bus. Thornycroft listed their 4 ton ‘PB’ in October 1926. Especially designed for delivery work in towns, were space was restricted, it was designed with the cab virtually on top of the engine. This was termed the ‘forward-control’ chassis and allowed the ‘PB’ a bigger load area than the earlier ‘KB’ model despite being on the same wheelbase and almost the same overall. The AEC ‘T’ type Green Line Coach. In 1932 Tillings introduced a new chassis, the STL, which came into service in 1933. During this time a new limited stop service was developed for passengers living 8-30 miles outside London, the Green Line. 1940 Fordson W.O.T.1/A1 Airfield crash tender. The RAF and RN used these vehicles along side the older Crossley 6x4 Teardrop (of 1936/7) and the Crossley 6x4 (from 1939) which carried the same configuration as the later Crossley 4x4. During the Battle of Britain the Fordson Sussex 6x4 equipped with 3 x 30 gallon froth extinguishers, and the Fordson WOT1 were the most common fire tenders. The WOT1A/1 carried 400 gallons of water and 65 gallons of foam concentrate. When the US Army Air Force came into Britain, sometimes completely taking over RAF bases, they took over the Firefighting equipment too. 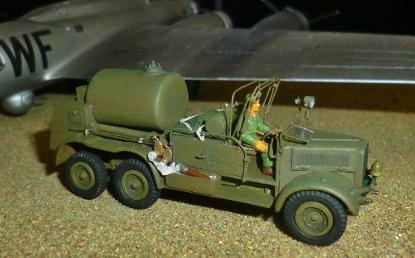 It was common to find USAAF personnel operating repainted RAF crash tenders throughout the war even alongside their own Dodge GMC based trucks..
1/72nd scale Airfix kit conversion. 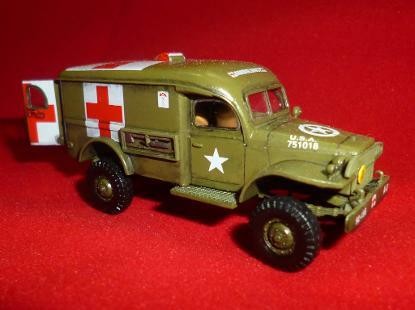 Some 22,857 of the Dodge WC 54 3/4-ton ambulances were built and deployed in all theatres of war, with many of the Allied powers (thought notably not Russia). The Dodge model code WC is derived from W for 1941 (first year of production) and C for half-ton rating. 1942 Clarktor 6 MILL-44 Heavy Aircraft Tug. Used across the American military forces for heavy towing jobs on airfields, Aircraft carriers and Quatermaster depots, the Clartor tugs proved their worth time and again. The Clark Equipment Co. built 3 models of the Clarktor tow tractor between 1940-1963, a "light duty" version, the heavy duty "Mill 44" and a heavy duty "Mill 50". The smaller version was used for towing small and mid-sized aircraft, small to medium weight goods trains and ground support equipment for aircraft maintenance. The heavy versions took on the big loads and could move up to 90 tons on level ground. Production commenced in 1947 with the chassis’ contract being given to AEC and the body initially to Park Royal and Weyman, later orders going to Saunders Roe and Cravens. 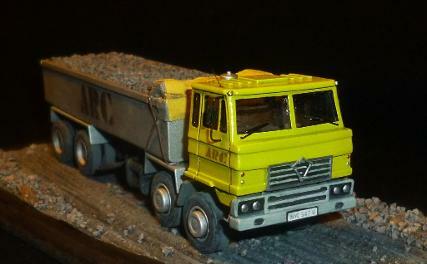 HO scale Keil Kraft kit. The bus is part of the British heritage. People always remember the older "double decker" buses. This was something that faded out in through the 1980s and 1990s, many bus companys saw falling passenger levels and single deck coaches replaced the double deckers in almost all towns and cities. Research found buses with a driver and conductor provide the most efficient service. Passengers do not have to wait to pay the driver, therefore getting on and off is much quicker and the bus is not kept standing at stops for long periods. Routemaster style buses have made a comback in several cities recently, but then so have trams! Park Royal Vehicles Ltd produced the Diesel Rail Car from 1958. Only five were built, three were used by Bedford area while the other two went to the Scotland. All of them had gone out of use by 1968. 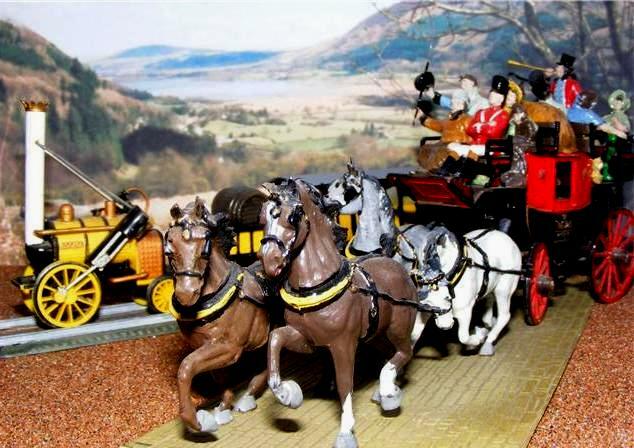 Sadly none of the vehicles exist today and the even the model kit is out of production. The transport trucks of the first world world war proved that logistics was more than just the railways themselves. Although the railways were capable of transporting huge volumes of cargo over long distances they were still reliant on rails!. Getting goods from the rail head to the consumers still needed horses and cart or trucks. These internal combustion engined trunks also proved they were a viable alternative to carts and to trains and after the war entrepreneurial minds bought up surplus vehicles and started local haulage firms in the towns and cities. As these companies proved their worth so more specialised vehicles arrived on the scene. In the United States these same lessons were being learned due to the expanse of the Country, and vehicle manufacuteres were quick to pick up on the needs of businesses across the continent. From huge articulated trucks covering city to city trips, to small vans for local deleveries and small tradesmen, commercial vehicles had arrived. International Auto wagon 1910 high Wheeler. ZIS-5 has its origins in the AMO (Automobile Moscow Obshchestvo) company which began to produce trucks in 1931. Running through the AMO-2, AMO-3 and AMO-4 series before the company was renamed in 1933 as ZIS (Zavod imeni Stalina). Production of the Zis-5 started in late 1933 and along with the GAZ-AA became the mainstay of trucking in the Soviet Union during the ‘30s, ‘40s and ‘50s. The Zis-5 continued to form the basis of development for many specialised vehicles even later than that. 1/76th scale Eastern express kit. The “Mechanical Horse” was introduced in the UK around 1934 to meet the railway companies need for a vehicle to replace horse drawn carriages. Several companies submitted designs but it was Scammell Lorries Mechanical Horse, designed by O.D North, that won through. The Universal Carrier is the most produced armoured fighting vehicle of all time. 113,000 were built between 1934 and 1960, in Britain, Canada and the Antipodes. In post war Australia they were modified to make up for a shortage of agricultural tractors and in Canada one was sent to Sable Island to tow life boats up and down thw 44km sand bar. Coles crane on Thornycroft chassis. The Coles EMA MKVII crane was a state of the art piece of Electromechanical engineering in the late 1930s and with WWII looming thousands were ordered for the R.A.F. for recovery of 'downed' aircraft. Available as a trailer version or mounted on an automotive chassis the crane saw action all around the world. Post war many of the combo's were sold off as war surplus and led long lives in the hands of large haulage firms and small privateer outfits alike. Austin received a state order forcing them to return to the production trucks in January 1939, the British government probably foreseeing the war to come. Austin’s new range, later called “series one”, comprised of two versions initially, the 2 tonne capacity K2 and the 3 tonne K3. ...was introduced at the 1948 Commercial Motor Show at Earls Court. Production followed in the autumn of 1949. 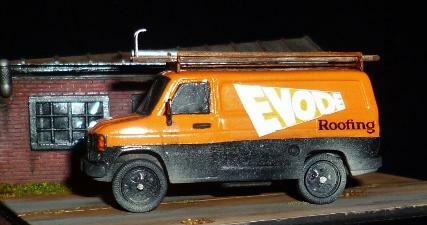 It has been used for many different commercial roles from Royal mail and “Meccano” delivery vehicle to ice cream van. There is a thriving owners club in the UK and so many memorabilia items it’s almost as popular Ferrari! 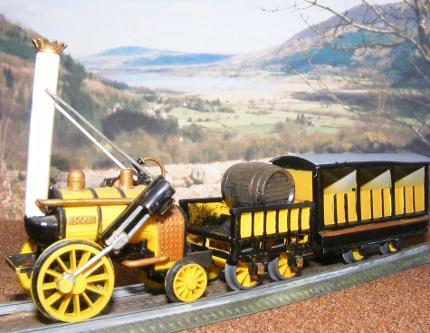 N gauge Classic model company kit. Called the most beautiful taxicab in the world, the FX4 stayed with the classic tall boxy profile that has its origins in a horse drawn carriage more than three centuries before. Officially designated standard taxicab by H.M. Government in 1958 it has almost the same styling as the FX3, which preceded it by 21 years. Turning circle 12ft.6ins (3.8m), seating for 5 and tall enough to let a passenger with a bowler hat enter without taking it off! How taxi cabs have changed over 60 years of developement. A further 50 years on and London taxi cabs still look very similar today! Cyrus Hall McCormick patented his horse-drawn reaper in 1834 and started McCormick Harvesting Machine Company with his brother in Chicago around 1847. His company did rather well over the years and trucks became a mainstay of the company. In 1986, IH was renamed Navistar International Corporation and focused on heavy duty diesel trucking. However Navistar struggled financially for some time. The S-Series was Internationals medium-duty truck line from 1978 to 1992 replacing the Loadstar. Like the Loadstar, S-Series trucks were commonly used for local delivery trucks and school buses. It also provided the basis for the F2575 tractor unit which was widely used across North America for haulage purposes. Model F2575s were usually powered by 300hp Cummins Turbo Diesel engines, but have also been seen with 350hp Caterpillar units. Gearing was through Fuller 9 speed transmission with the option of automatic units available. Although this type of work horse has been around for many decades now current "Health and Safety" law has made them more than common place. 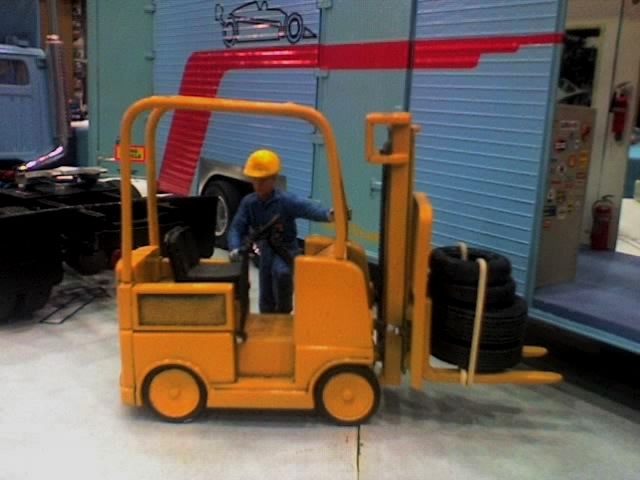 Fork lifts have evolved down many routes becoming battery powered carts moved by small wheels, lightweight units capable of being carried as part of a delivery truck system or full on warehouse movers much bigger than the one that is part of our museum. In Canada, the Ford "C" had an identical twin - the Mercury "M" Series offered from 1957 to 1972. Many truck makers used the Ford C-Series cab for vehicles as diverse as large airport crash trucks as well as cab-overs, tippers, bulk liquid tankers even vacuum street cleaning trucks. In our collection the C-800 cab-over has been converted for an F1 team transporter of 1977. A far cry from today’s F1 back up services but a clear sign of the new ultra professional image conscious age that was coming. The Transit was a modern marvel, a huge step forward from the Ford Thames van it replaced and the Commer and Bedford CA vans it was competing against. It’s flexibility, comfort and ease of use were such a revelation the Transit was an immediate success and soon a familiar sight on British roads and became a byword for all light commercial vans. Today there is hardly a company in Britain that hasn’t used a Transit based vehicle. A cargo van in short and long wheel base, a minibus, cutaway van chassis, a drop-side pickup truck, recovery vehicles, food vendors, the list of Transit chassis applications is huge making it a bedrock of local commerce and allowing Ford to Market the van as “the backbone of Britain”. 4mm-1ft scale, 00 gauge, Davric kit. Edwin Foden was apprenticed to Plant & Hancock in 1856. Plant & Hancock were manufactured agricultural equipment but Foden was looking for a more rounded education and left Plant & Hancock for an apprenticeship at Crewe Railway Works. In 1860 Foden returned to Plant & Hancock at the age of 19, not long after this he was to become a partner in the company and by 1866 Foden was a full partner in the renamed company “Hancock and Foden”. Foden developed his company along the lines of consistently chasing the best quality of product at all times and went on to widely influenced future truck designs, initially running on steel tyre wheels Foden switched to solid vulcanised rubber tyres when they had developed the product sufficiently to be practical and then was the first to introduce pneumatic tyres on lorries too. There are more commercial vehicles to be added to the museum, come back again to see what new vans, lorries, cranes and 'cabs make it through to these pages.